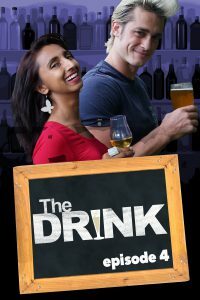 It’s finally here–August 2nd brings the launch of our new show for Bell Media called, The Drink. In it we explore the best that Toronto has to offer in terms of beer, sake, scotch, cocktails and of course, wine! In it we visit a super high-tech private wine storage facility, we trace the roots of a bottle of wine in a vineyard-to-restaurant segment, Alex breaks down how to taste wine like the pros do, and we go all out at one of the grandest wine tastings of the year! Priya: Alex, what was your favourite wine moment in the show? Alex: By, definitely tasting an 1815 Madeira at the Holiday Party! Oh and the 1896 Madeira wasn’t so bad either! How about you my lady? Priya: Walking through the production process at Karlo Estates. It’s probably my favourite Ontario winery located in beautiful Prince Edward County. Sherry Karlo is an amazing hostess and love the fact that they’re the first vegan-certified winery in North America! Alex: Best Petit Verdot in Ontario and quite possibly in the world! Priya: Wow, that is extremely high praise coming from an Old World snob like you. Alex: The County lies on the same latitude as Burgundy, France and many of the wineries there make wine in the Old World style so it’s not that shocking. Plus, their Petit Verdot vines are especially old so they produce more concentrated grape juice. 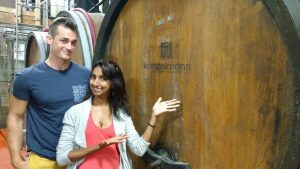 Priya: I liked being walked through the massive production facility and tasting both a red and a white in various stages of fermentation. The cabernet franc tasted ‘purple’ as I recall while the riesling tasted like a mimosa with a bit of apple juice! Alex: You said it my lady. During fermentation the primary fruit flavours of the wine really stand out. The juice tastes zingy, warm and alive! Priya: Ah, so that’s why the cab franc reminded me of a warm, mulled wine. I was surprised at how warm it was. Folks, for those of you who haven’t seen a ‘wine thief’ before, you’ll learn what that is in this segment at Karlo! Alex: And no, it’s not me…well maybe it is but you’ll have to watch to find out! 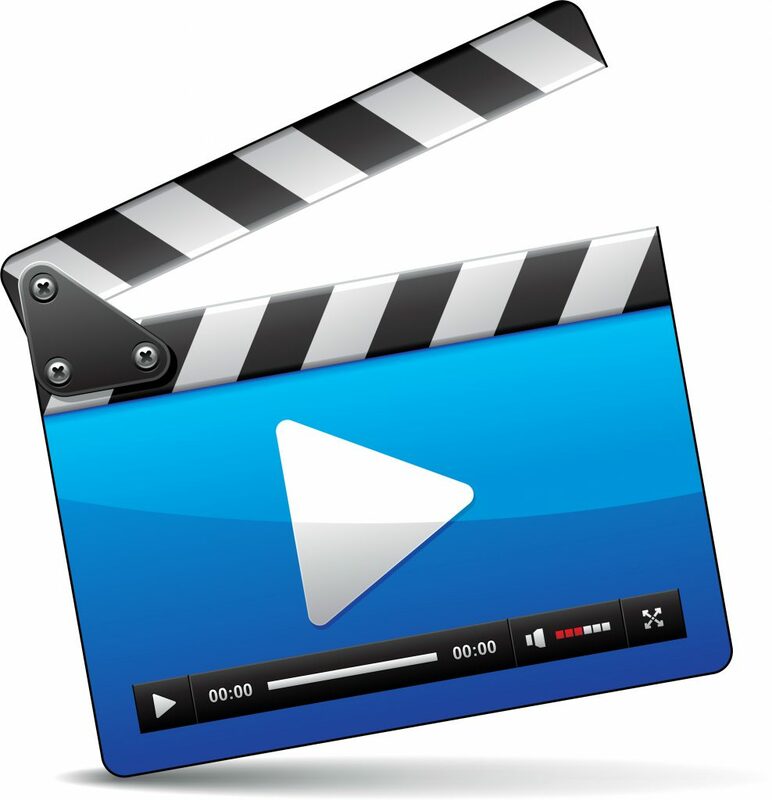 Priya: That’s right so if you’re a Bell subscriber, look for us on Channel 1 as of August 2nd. It’s on demand but it’s free. We had a blast filming this show and hope you enjoy watching it. Alex: Yes bys, tune in to learn all things regarding the art of drinking and why Toronto is one of the finest places for it! Priya: If you’re in Toronto, come see us as part of the Celebrity Chef Stage at this year’s CNE! We’ll be talking the FAQs of wine on August 23rd at 2pm and 5pm. Hope to see you there! Join hosts and real-life couple, Alex Powell and Priya Rao as they explore venues and events to enjoy the best wine, beer, scotch, cocktails and even sake in the city of Toronto. He’s a Newfoundlander and Certified Sommelier currently at Celebrity Chef Susur Lee’s new hotspot, Frings; she’s an actor..entertainer, Torontonian born and raised. Their ‘expert vs casual drinker’ dynamic will keep you laughing while you’re drinking! Did you know Toronto has it’s own, organic whiskey distillery? Alex and Priya take you to the ‘Bermuda Triangle of Toronto’ to find it. Who will win the scotch game of thrones? Plus a breakdown on what the real difference is between scotch, whiskey and rye. Episode 3: Sake, Wine and Beer, Oh My! You don’t have to fly to Japan to visit a sake distillery, just head down to Toronto’s Distillery District. Meanwhile, a short drive will take you to one of Toronto’s best breweries, and the magic of TV transports our dynamic duo to the vineyards of Karlo Estates in Prince Edward County. Episode 4: Calling All Wine-o’s! This Twilight Zone tribute takes Alex and Priya to Toronto’s elite Fine Wine Reserve – like a safe for serious wine-lovers. Plus, Alex gets pumped for the annual Winetasters of Toronto Holiday Party. And, FINALLY we show you how to break down ‘body’, ‘legs’ and ‘nose’ to taste wine like the pros. 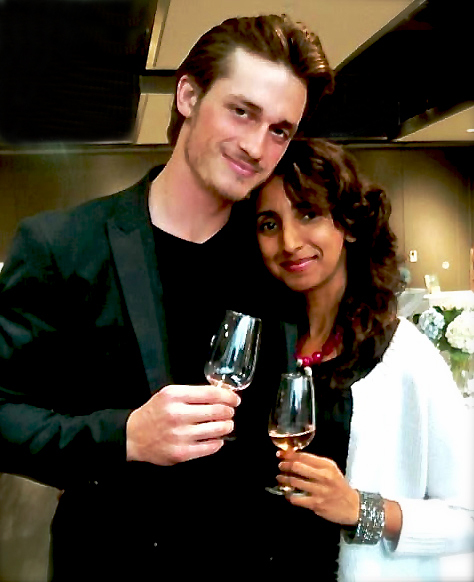 Alex and Priya are not only wine lovers, but lovers in real life. No wine snobbery here — they’re all about bringing wine back to the masses. Alex is a Certified Sommelier who lives, breathes, and of course, drinks wine. He is very passionate about wine and is currently the in-house sommelier for celebrity chef Susur Lee’s “Lee Restaurant”. Together, they are the hosts of the television series, “The Drink” on Bell FIBE1. Visit www.avineromance.com for more info.